SG-1 joins forces with their robot doubles to rescue an alien world from the Goa'uld Cronus, while Teal'c seeks revenge for the murder of his father. SG-1 arrives on the planet Juna and immediately comes under attack from a group of Jaffa and local Juna warriors. One of the local leaders, a young man named Darian, recognizes them. He knows all their names, and tells the Jaffa that these are the ones who led them ina rebellion against Heru’ur, banishing the Goa’uld’s servants from their world. The team has no memory of these events. Samantha Carter, Daniel Jackson and Teal’c are imprisoned, but Jack O’Neill manages to escape. He captures one of the Juna warriors, and steals his uniform. The team is led into a large pyramid as a Goa’uld mothership enters orbit, and forced to their knees as the powerful System Lord Cronus transports to the surface. He recognizes them, of course, but reminds them that the treaty between the Goa’uld and the Asgard protects the planet Earth — but not S.G. teams who are found offworld. He will show them no mercy. Jack enters the room disguised as a Juna warrior, and watches in silence as Cronus orders Darian to kill Daniel. Though Daniel sees Colonel O’Neill watching, he shakes his head — telling him not to reveal himself and attempt a rescue. Cronus shouts at Darian, who fires the staff weapon. Daniel’s head flies off, and his body falls limp to the ground. The local warriors, the Jaffa — even Cronus himself — are shocked at what they see. Daniel is not even human. He is an android. Back on Earth, the real SG-1 watches as a signal is received through the Stargate. It is a single word sent on the I.D.C. frequency: “Comtraya.” They recognize it as the greeting used by Harlan, an artificial lifeform from PX3-989 (“Tin Man”). General Hammond orders the iris opened, and Harlan arrives. He tells them that SG-1’s robot duplicates did not bury the Stargate on their world, as they had agreed to do. Instead, they have been going on missions to other worlds, fighting the Goa’uld and exploring the galaxy. But now they are 16 hours overdue, and will run out of energy in just 8 hours. The team refuses to go after their duplicates, until they learn that the world they went to is Juna (P3X-729) — a planet formerly under the control of Heru’ur, which SG-1 helped to liberate. A probe is sent through just in time to catch Colonel O’Neill’s double fighting off a group of Jaffa. Darian joins him, having realized that Cronus is not a god. Cronus has taken over the planet, and the real SG-1 has an obligation to help (though Daniel is already off-world on another mission). When they arrive, the two O’Neill’s are less than happy to see each other. O’Neill blames the android for lying to him and leaving their planet; the duplicate blames O’Neill for having left the people of Juna ripe for Goa’uld picking. But with no time to argue, the team infiltrates Cronus’ mothership. Meanwhile, Cronus is fascinated with the android versions of Teal’c and Carter. He orders them studied by his scientist, a Goa’uld named Ja’din, so that he might benefit from the advanced technology. The two refuse to cooperate with her, even under torture. The android Teal’c requests an audience with Cronus, to bargain for Carter’s life. Intrigued, the Goa’uld accepts, though he knows that the Jaffa has a blood oath to get his revenge for the murder of Teal’c’s father (“Fair Game,” “Crossroads”). It is a mistake; the super-strong and fast android Teal’c overpowers the Jaffa guards and grabs Cronus. Carter’s robot duplicate manages to escape, and meets up with the real team. The real Teal’c goes to look for Cronus on the command level, and Carter’s double helps Carter and O’Neill to lock down the ship. It costs the android her life, though: after reaching through a force shield to shut down all the compartment doors, she collapses. Cronus overpowers both Teal’c’s, and turns to kill the real Jaffa in the same way he killed his father years ago. He reaches into Teal’c’s symbiote pouch, and begins to slowly crush the larval Goa’uld within. But Teal’c’s robot double has not been completely disabled. He shoots the System Lord in the back with a staff weapon several times, and Cronus falls dead. “For our father,” Teal’c’s double says to him. He collapses, apparently dead himself. The team has eliminated one of the galaxy’s dominant System Lords, seized control of his ship, and saved the planet of Juna again. Jack tells Darian to spread the word to his people — if they don’t believe that their “god” has been killed, they can come and see for themselves. But as the team reassembles on the surface below, Jack’s robot double also succumbs to his battle wounds and failing power supply, and dies. As robots, of course, SG-1’s doubles have changed very little from when they were created three years ago. Daniel’s hair is still longer, as is Carter’s. Jack has not grayed very much. And Carter is still a captain. SG-1 visited Juna once before, and organized the natives in a rebellion against the Jaffa of Heru’ur, who controlled the planet but had not visited it personally in many generations. The people buried their Stargate after SG-1 left, but that did not protect them. Cronus soon came in ship and took over the planet — perhaps because it’s location holds some strategic military value to the Goa’uld. When did this occur? It has not been depicted or mentioned in any other episode, but the fact that Darian identified Sam as “Major Carter” indicates that it happened some time after the events of “Fair Game” just under two years ago, when she was promoted to that rank. The Asgard-mediated treaty does not protect humans when they journey to other worlds, as Cronus warned (“Fair Game”). The Goa’uld are well within their rights under the Protected Planets Treaty to capture S.G. teams offworld. Cronus tells the team that they will all “pay for their sins,” potentially indicating a religious system similar in some respects to Judeo-Christianity. Teal’c’s torturer, Terok, also spoke of sin, repentance and the afterlife in “The Serpent’s Venom.” This seems odd, since the Goa’uld presence on Earth was nearly nonexistent at the dawn of Christianity (“Demons”). Carter’s robot double invented a portable power pack for the androids, which can power them for up to 48 hours. Contrary to what he promised O’Neill (“Tin Man”), Jack’s robot duplicate never intended to bury the Stargate on Harlan’s planet. The duplicate SG-1 has been going through the gate on short-term missions for the past three years. Cronus’ arrival on Juna has startling implications for the S.G.C. Many times in the past,they have instructed natives of alien worlds to bury their Stargate to prevent the Goa’uld from returning (“Cor-ai,” “Demons,” and others). What other worlds are of significant value to the Goa’uld, and are thus still in danger? Cronus and his Goa’uld servant lept to the conclusion that Carter and Teal’c were also robots, because they discovered that Daniel was one. This seems unwarranted. Cronus tried to kill Teal’c by crushing the larval Goa’uld symbiote in his pouch, just as he’d killed Teal’c’s father many years before (“Crossroads”). The symbiote’s blood mixes with the Jaffa’s, poisoning him. Teal’c’s robot double was injured with only one staff weapon blast — and the majority of that was filtered by the Jaffa standing in front of him. It seems more likely that he died from a loss of power, and not from this injury alone. Carter’s double, on the other hand, appears to have died from overloading her electrical system. And although O’Neill’s robotic duplicate received multiple staff weapon injuries, he told Darian that he was dying because he was running out of energy. Carter has learned a lot about the internal operations of a Goa’uld mothership, knowing even how to lock down the level section doors. Where did she learn this? It seems unlikely that she would have acquired this knowledge during her few times aboard Goa’uld motherships in the past (“Within the Serpent’s Grasp,” “Out of Mind”). Perhaps she knew how to operate the systems from the latent memories of the Tok’ra Jolinar (“The Tok’ra, Part 1”). The death of Cronus will certainly have a major affect on the balance of power in the galaxy. The System Lords were already outnumbered by Apophis’ new fleet by more than two-to-one (“The Serpent’s Venom”). Teal’c may have inadvertently given Apophis an even greater edge in conquering the System Lords and ruling the galaxy. The S.G.C. computer system has a set frequency on which I.D.C. codes are transmitted. Other information, such as text, can also be transmitted on that frequency and read by the computers. The standard Goa’uld mothership has, on average, a standard compliment of as many as 1,000 Jaffa. A Goa’uld hand device can repel a blast from a zat gun quite effectively. Cronus – The powerful System Lord Cronus is dead. Through his own arrogance, he allowed Teal’c’s faster, stronger robot double an audience with him. But Cronus did have the situation under control, until the real Teal’c appeared as well. Well in character for a Goa’uld, Cronus killed one of his personal guard without a second thought, in order to shoot Teal’c’s robot double. And when he tried to kill the real Teal’c, he thought it perversely appropriate to kill him in the same way that had he murdered Teal’c’s father. Teal’c – Teal’c has avenged his father’s death by killing Cronus — though he may struggle with the fact that he himself did not kill the Goa’uld who murdered his father. Cronus was finally killed by Teal’c’s robot duplicate, who himself savored the revenge at first by slowly suffocating Cronus. Teal’c also witnessed the death of his nearly-immortal robot double, which may also have a lasting affect on him. Jack O’Neill – Betrayed by his robot double, Jack confronted him about lying to him, promising that he would bury the Stargate on Harlan’s world. But he was met with an equally powerful argument: SG-1 has been making messes all across the galaxy, leaving planets like Juna ripe for invasion by the Goa’uld. O’Neill finally saw his duplicate risk his life for the mission and the people of Juna, and watched him die. Jack confessed to the robot that he finally sees the duplicates as “real,” as more than just mechanical copies of the real thing. “Then I believe we are done,” the android replied. Samantha Carter – Carter also watched her robot double die, giving her life for the team and the mission when Sam herself could not break through the force shield. Where else have the duplicate SG-1 gone in the past three years? What good have they accomplished, and what mistakes have they made? For what actions will SG-1 be blamed in the future? When did the real SG-1 first visit Juna, and help free them from Heru’ur’s forces? What will become of Harlan? Can he run his complex alone? Will the S.G.C. maintain a presence on the planet Juna, in order to protect the inhabitants, or leave it to be overtaken by yet another Goa’uld? Will SG-1 retain control of Cronus’ mothership? How can they operate it? What will become of Cronus’ Jaffa? Will they regain control of the ship, and perhaps heal Cronus with a sarcophagus? Will they be left on Juna, or given control of the ship and expelled from the planet, or perhaps taken to a Goa’uld-controlled world and abandoned? Can SG-1 convert them to their side, now that their god has been slain (as other Goa’uld absorb a slain enemy’s forces into his own [“The Serpent’s Venom”])? Are SG-1’s robot doubles dead? Can they be re-powered and repaired? Or does Harlan still have the necessary data on hand to create new androids, without the real SG-1 there to serve as templates? VOTE! 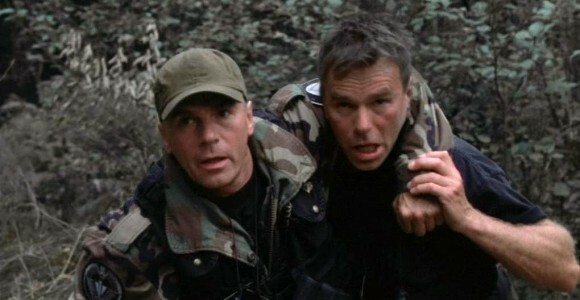 How would you rate SG-1's "Double Jeopardy?"